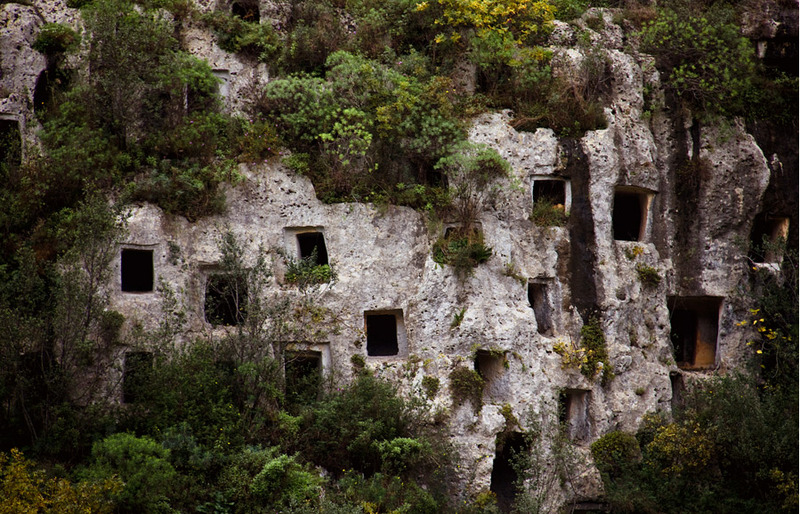 Hidden away in the Hyblaean Mountains of Sicily lies a prehistoric cemetery called the Rocky Necropolis of Pantalica. Used during the late Bronze Age between the 13th and 7th century BC, it is a collection of cemeteries filled with thousands of tombs cut into the walls of a canyon resembling a beehive. Inhabited by various populations over the centuries, it was the center kingdom of the Sicels, one of the original Sicilian peoples. The necropolis is also situated on a place of great natural beauty with high cliffs overhanging a limestone ravine carved out over the millennia by rivers flowing in extremely narrow valleys. This makes the necropolis something of a natural fortress and highly inaccessible to reach. The Necropolis of Pantalica extends some 1,200m from north to south and 500m from east to west in the region of Sortino, Sicily in Italy. Located in the valley of the Calcinara and Anapo rivers, the site consists of a necropolis with thousands of graves cut into rock along the sides of a deep gorge. In the hilly terrain which consists of caverns and precipices, about 5,000 of these tombs or burial chambers are visible, most of which have been carved into limestone. The tombs are relatively small in size and are either square, rectangular or elliptical in shape. Inside, they look like artificial caves with some having more than one room. The necropolis consists of five cemeteries spread out over a large area. The necropolis of Filiporto, which consists of almost 1000 tombs is located on the southwestern side of the promontory. The North West necropolis is one of the earliest in the area and dates back to the 11th-12th century B.C. The Cavetta necropolis has tombs and rock-cut houses of the prehistoric and later periods. The North necropolis is a spectacular cemetery of about 1000 tombs covering very steep slopes overlooking the Calcinara river. The South necropolis extends along the Anapo river for over 1 kilometer with remains of large rock-cut dwellings on the slopes to the east. At the highest point of the plateau are the ruins of the Anaktoron (a princely palace) and one of the earliest structures in the area. Thought to have been built around 1100 BC, the Anaktoron was once a megalithic building used during the Byzantine era and may have been influenced by Mycenaean architecture as it resembles, in miniature, Mycenaean palaces. Probably, it was the palace of the chief of Pantalica or some kind of religious building. Since no other prehistoric houses have been found on the hilltop, which is rather eroded, the location of the original prehistoric residential quarters remains uncertain. Pantalica (Sicily): Groundplan detail of the Anaktoron (king's palace). Vertical aerial photograph taken by kite aerial photography ( Wikimedia Commons ). Pantalica was founded by indigenous pre-Greek populations coming from the coast of Sicily and developed at the end of the Bronze Age, beginning into the Iron Age. The tombs were carved beginning in the twelfth century BC. and largely abandoned by the time the Greeks settled in the area around the seventh century BC. Whoever settled at the site was part of a Neolithic civilization which later came to be identified with the Sicanians. Around 1300 BC, the Sicanians tribe left their coastal settlements and settled down in the valley between the rivers Anapo in the south and Calcinara in the north. They sought refuge in inaccessible and inhospitable mountain regions, chosen for their defensive characteristics. For dwellings, the inhabitants used the existing natural limestone caves and carved artificial ones into the mountain. When the Sicels (or Sikels) arrived, they displaced the Sicanians, who at one time inhabited most of Sicily and are considered to be one of the original Sicilian people. By 800 BC these communities flourished westward in the area of the Sicanian Mountains which bear their name. The name “Pantalica” is Byzantine but the ancient name of the necropolis has not been revealed or identified by historical sources. Pantalica could be related to the ancient Hybla, one of the settlements of the area in the Pre-Greek period. According to scholars, King Hyblon from the Greek colony of Megara Hyblaea, founded the area in 728 BC. The subsequent expansion of the city of Syracuse led to the downfall of the colony with the kingdom of Syracuse expanding inland and the founding of Akrai in 664 BC. Palazzo del Principe (Anaktoron) is the last vestige from that era along with the thousands of tombs carved out of rocks in the small caves. In 665 BC, during the Hellenistic colonization of the city of Syracuse, the settlement was destroyed. In the early Christian and Byzantine period, new tombs were created. After centuries of silence, Pantalica was once again inhabited during the 8th and 9th centuries AD, and served as a major point of defense against the Arab invasion of Sicily. The Pantalica would also became a place of refuge for the Arabs, who named the place “Buntarigah” meaning caves. The Saracens (Muslims) found this inaccessible canyon to be perfect hiding spot for them and established a community here during the middle ages. Even today, the ancient houses built into the rocks during the Byzantine times are still visible along with the small rock chapels called Grottas. After the valley was inhabited by the Normans, it was finally abandoned. Paolo Orsi, an Italian archaeologist, began excavating the area between 1895 and 1910, although most of the tombs had already been looted long before his time. Materials of Mycenaean origin and monumental structures were recognized, which enabled the identification of the Anaktoron. The many finds from the site (including pottery, bronze tools, bones), are on exhibit at the Paolo Orsi Archaeology Museum in Syracuse, Sicily. The Necropolis of Pantalica offers a testimony to the development of civilization over some three millennia and is the largest stone necropolis on in Europe. Today, it is a conservation area and in a good general state of preservation. In 2005, it was named a UNESCO World Heritage Site along with the nearby historical city of Syracuse. If you wish to make a visit to see the tombs of Pantalica, you can access the site via the towns of Ferla and Sortino, in the province of Syracuse. Ferla provides the most direct access. However, if you have the time, the trail from Sortino to Pantalica is most beautiful, and passes some other ruins, including anaktoron, the “palace of the prince”. Walking tracks can be picked up at the ranger’s checkpoint. Alternatively, guided tours are available. I have been there. It was not signage marked when I was there. It was on a map that I bought in Sicily. You can drive to it. Then park off the road and walk in it. I love this place, I will go to Palermo in Febraury. I want visit Pantalica, I read this article and I fell in love even more.